This mani is pretty apt today because I'm having a pretty bad pain day and I think staying strong and having hope can be the two things that can get a spoonie through bad days, that and lots of laughs at weird things, you know that's my jam, mmmm jam, I could go for some jam right about now, or even better, a pb&j sandwich. Brb, calling Jim to tell him to get me some peanut butter and strawberry jam, oh and some white bread. Ok, so these water decals are from Born Pretty Store and you get this sheet with about 150 individually cut decals that you can mix and match. 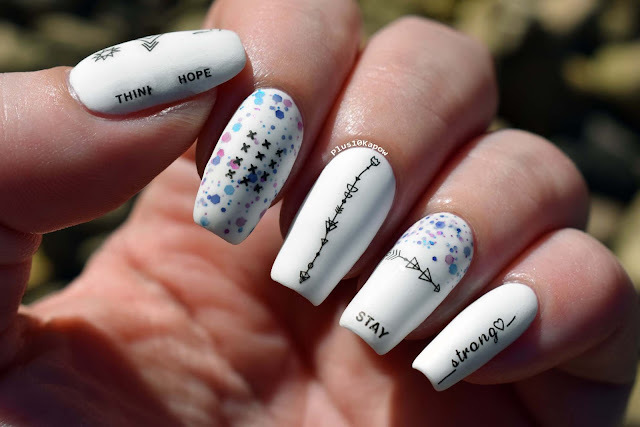 When I was deciding what to use these for, some of the words sang out to me and I knew I had to do some spoonie nail art and so 'Think Hope, Stay Strong' was born. 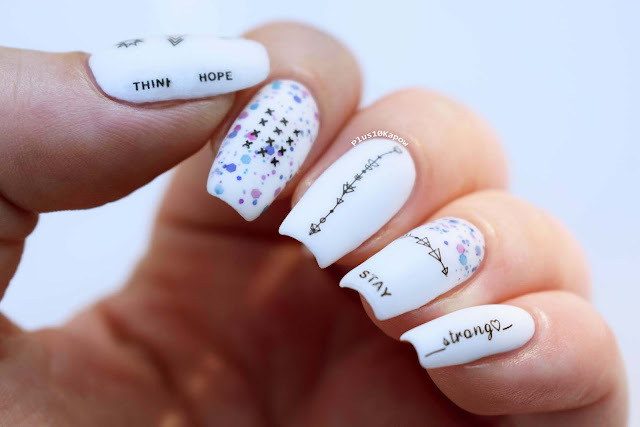 Technically it says 'Thini Hope' because I messed up on placing 'Think' twice and there were only two think's, so I had to just let it go. The decals being individually cut can be both a blessing and a curse, because it means that you don't have to faff cutting as close as possible but it also means, that because most of the decals are tiny, they can be incredibly fiddly, resulting in them not being straight or having missing ends when you finally manage to get them on your nail. 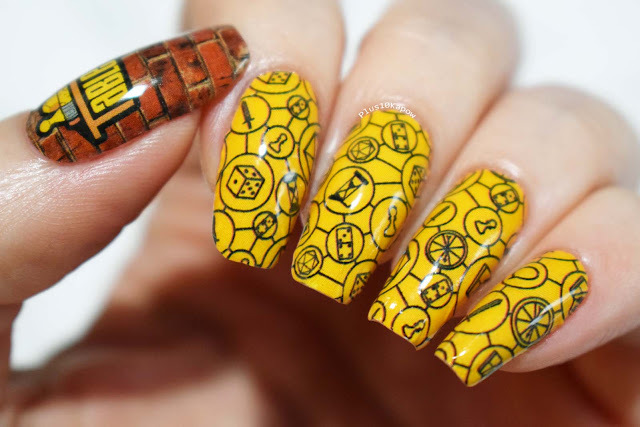 This can also be a bit of a pain because these decals basically moulded into the polish the moment it was placed, leaving no room for placement error, there is just no way to get these suckers back off the nail. 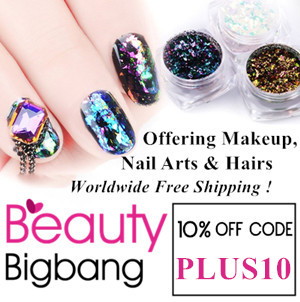 This is what happened to the arrow on my middle nail, I originally wanted it to be straight down the middle but it went wonky on the placement, but the more I look at it, the more I think it works, for two reasons: 1) with a chronic illness, nothing can ever be straight forward again, EVER, and 2) that's pretty much how I walk with my lack of balance, bahahaha! What you also can't see is the rest of what's on my thumb. In the middle is one of the geometric designs and on either side of it was the sun and moon decals, however, I reeeeeaaaaaallly messed up the moon and it is just pieces of decal, so I've hidden that away mostly. If I didn't have such a fiddly time with them, these would be my perfect decals, individually cut, good quality, moulded into polish so edges disappeared and kept their colour all the way through the process. Anyone got any tips on how to make it not so fiddly for a person whose hands just derp all the time? I added KBShimmer Prints Charming because it's a phenomenal polish and it looks fantastic mattified! White polish is Barry M Cotton, all topped with one coat of Seche Vite and one coat of Barry M Matte Top Coat. 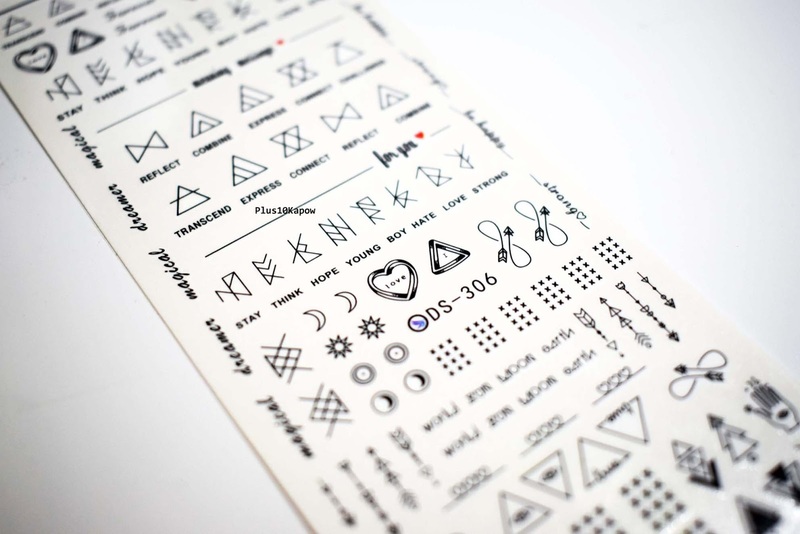 You can find these decals here for £0.70/$0.99 which is so cheap! 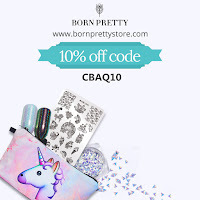 Don't forget that when shopping on Born Pretty, you can use my code CBAQ10 for 10% off all non sale items. Stay strong, you absolute beauties!